Powers/Abilities: The Toymaker has at his command a series of mechanical killer toys. At first it took a long time for him to make a killer toy, but eventually he became able to covert normal toys into killer ones almost instantaneously using special adaptor spheres he carried with him. Along with the standard array of army toys (tanks, soldiers, helicopters, etc) he also uses explosive clockwork mice and teddy bears with machine guns in their eyes. His earliest weapons included small soldier robots with paralysis rays. History: The Toymaker was a scientist who transformed harmless toys into remote controlled weapons of destruction. Ostricised by the rest of the scientific community, who thought his ideas were inhuman, he vowed revenge on humanity, and created an army of killer toys up in a remote Scottish castle. But his planes were stumbled upon by Joe and Sandy Douglas, and in spite of initial scepticism, they managed to alert the authorities to the threat. Thus began several years of them battling against the Toymaker's evil plans. Comments: The Toymaker is opposed by Joe and Sandy Douglas. What is it about British characters and killer toys? 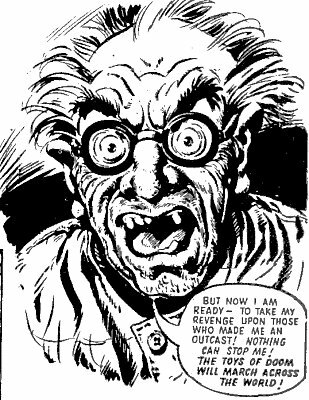 You've got Dr. Droll (who appeared in a strip called Threat of the Toymaker), you've got the Terror Toymaker in Jackpot, you've got Nick Jardine and his Toys of Doom (his toys were invented by his great-grandfather, the original Toymaker), and of course the original General Jumbo. In modern times you can add Toybox in Top Ten. Okay, so newer information now lets me know that the Toys of Doom strip in Buster (with the Toymaker) was reprinted as Threat of the Toymaker (with Dr Droll) in Smash and then again (with at least some new artwork) as The Terror Toys (with the Terror Toymaker) in Jackpot, with one last reprint of the original strip, back at home in Buster but under the title of The Terror Toys in 1986. 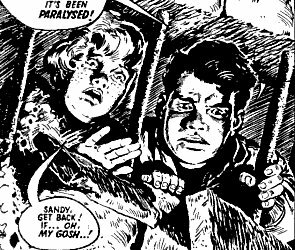 Then a new story was created as a continuation as the Toys of Doom (with Nick Jardine, great-grandson of the the Toymaker) in EAGLE in 1989. Confused? You will be. 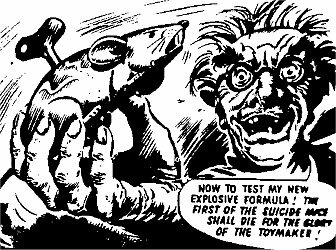 My question remains valid - what is the British fascination with killer toys, with one strip being reprinted and redone so many times?.